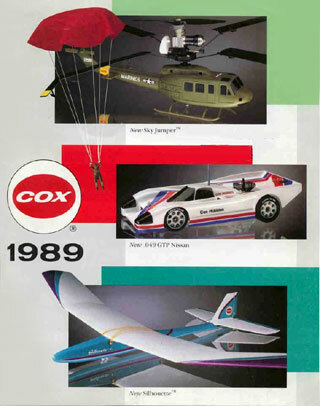 This page shows title pages of the annual Cox catalogues. 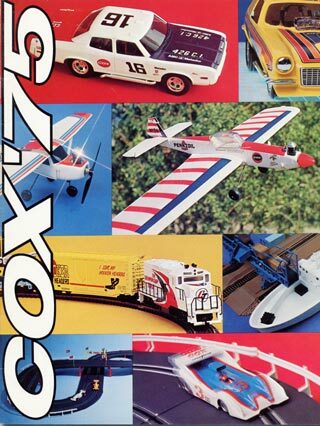 Besides bringing up memories of those years, the graphical design of these catalogues also reflects some of the contemporary "Zeitgeist". 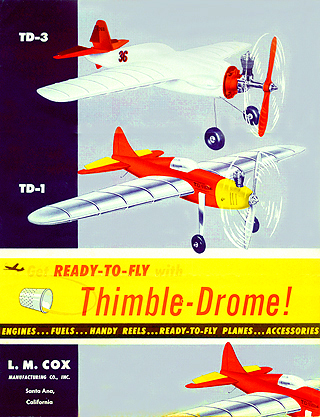 The birthday of the L.M. 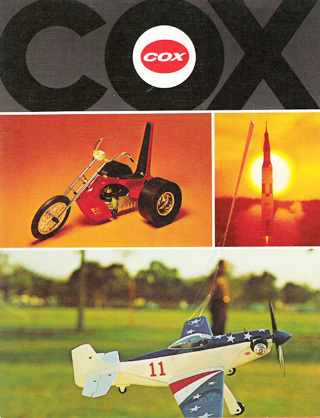 Cox company. 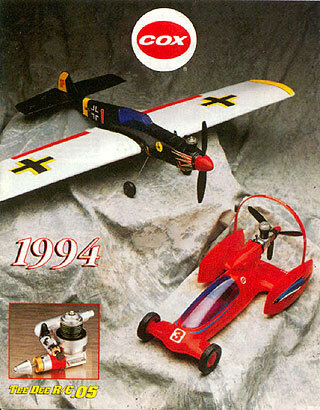 This picture has been provided by Stefan Susini. 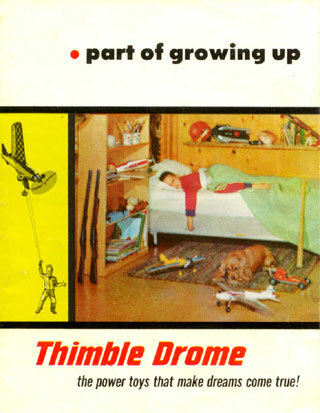 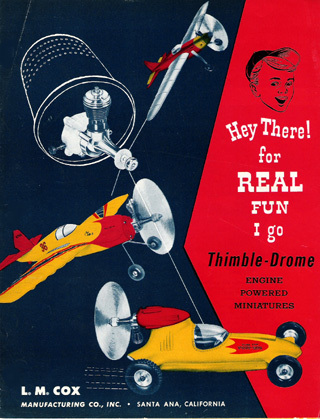 Note the Space Bug Jr. engine in the thimble! 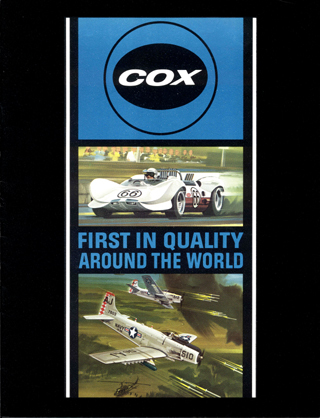 This year was the 10th anniversary of Cox. 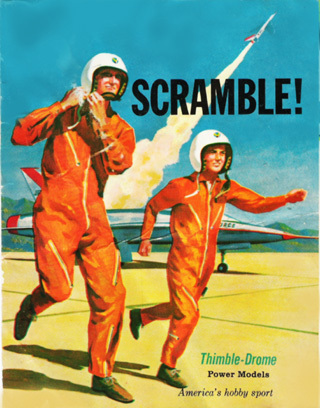 What would your family think about you, wearing such a nice outfit? 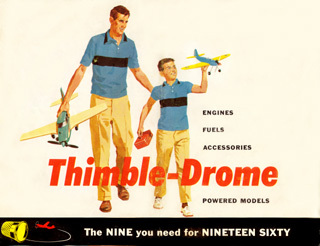 Again: a father and son hobby. 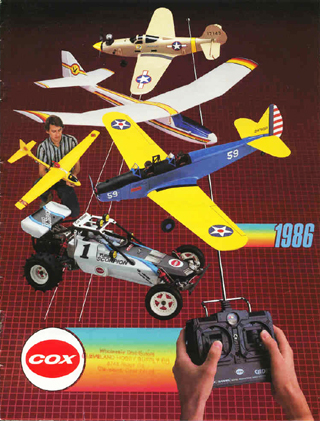 Of course the father flies the expensive large Comanche while the son still has to master his PT 19. 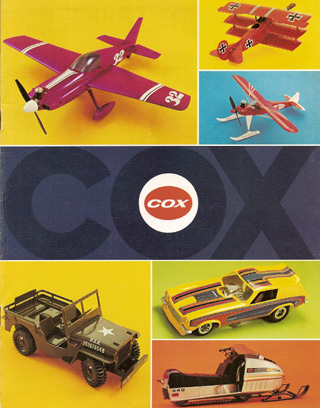 This seems to be a mini catalogue only. 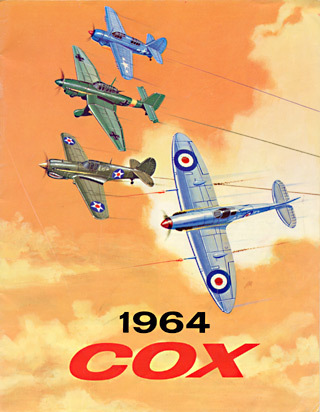 Could you provide a scan of the full 1961 catalogue? 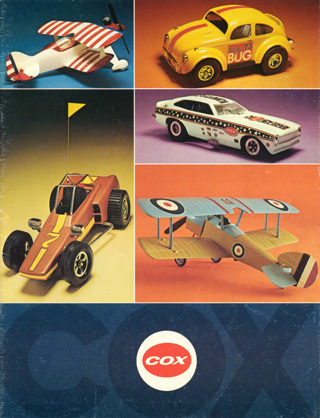 This seems to be a mini catalogue only. 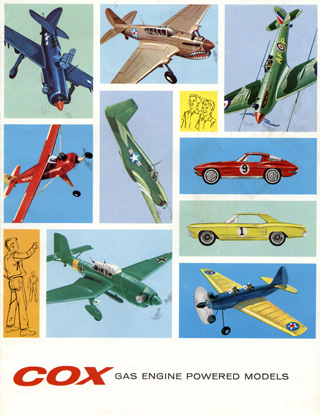 Could you provide a scan of the full 1962 catalogue? 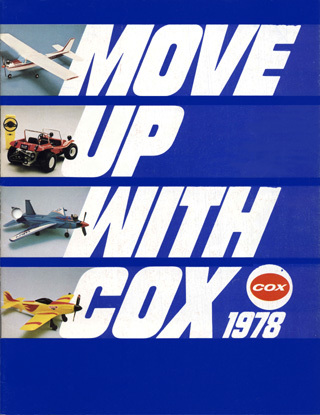 In 1963 Cox moves to its new buildings. 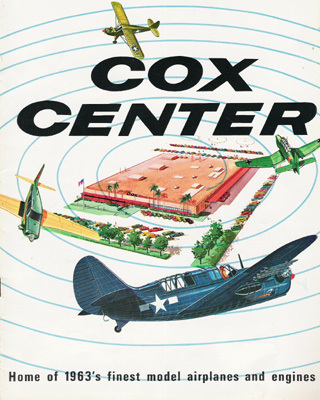 The title page and one page inside the catalogue are proudly dedicated to the new building in East Warner Avenue, Santa Ana. 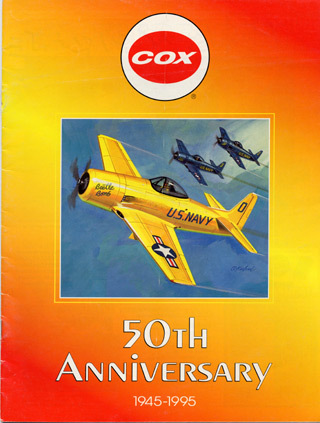 This year was the 20th anniversary of Cox. 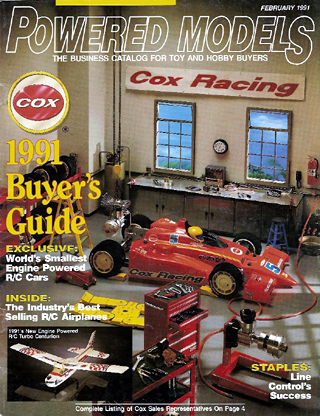 This is the year when L. M. Cox had to sell his company. 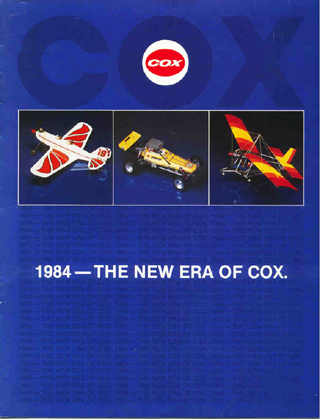 Probably the last catalogue designed by the old team. 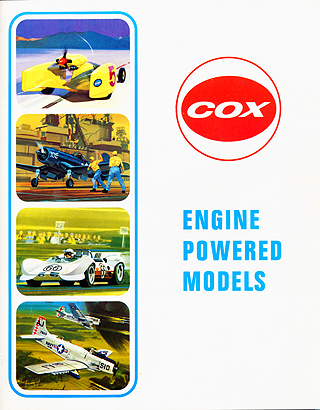 Still features great artistic renderings of the powered models. 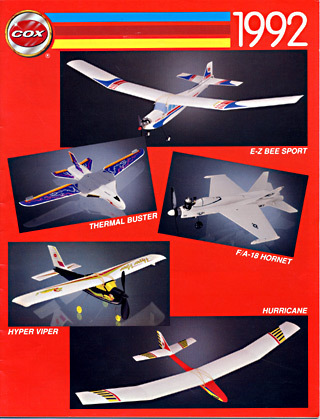 Under the new roof of Leisure Dynamics Inc., for the first time photographs have replaced the artistic renderings. 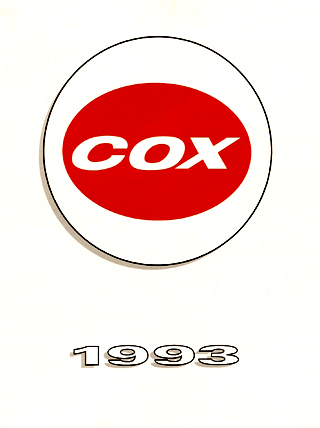 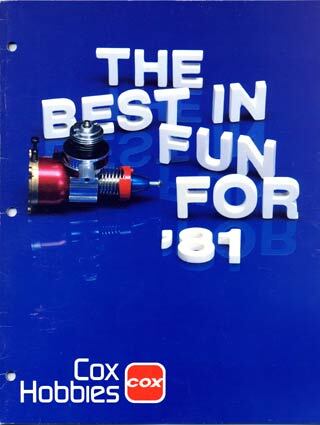 This year was the 30th anniversary of Cox. 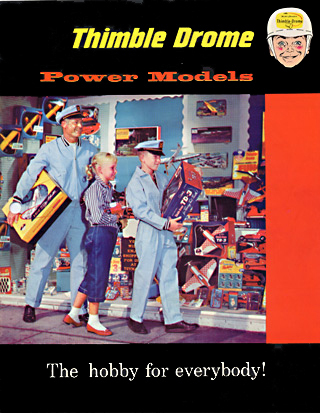 Probably the last catalogue produced by the Leisure Dynamics group before filing for bankruptcy. 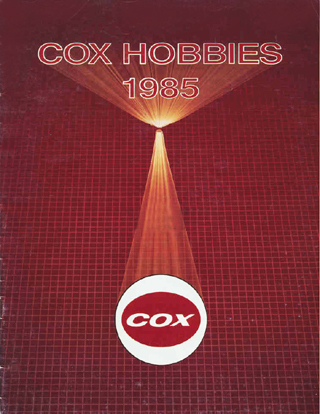 In 1983 Bill Selzer bought the company back and breathed new life into Cox. 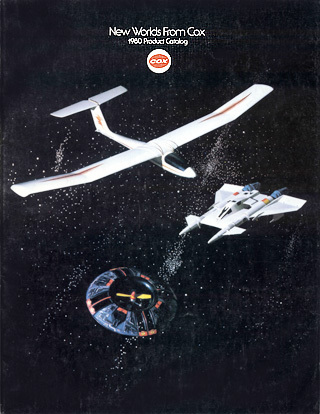 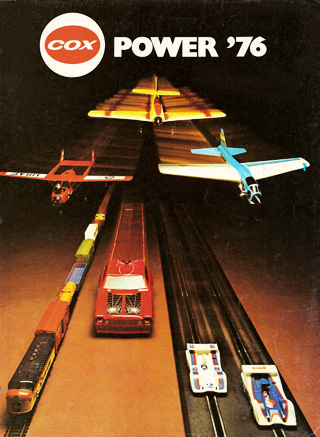 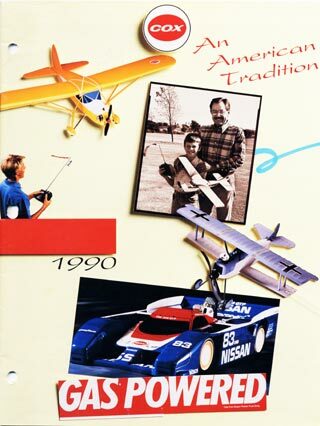 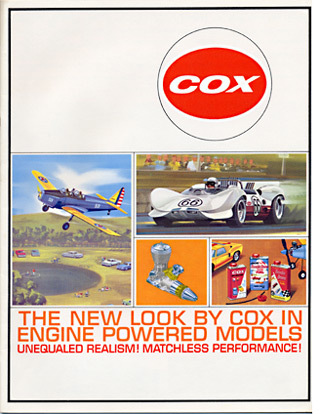 At least the catalogue cover shows cost savings by recycling pictures from the 1983 catalogue cover. 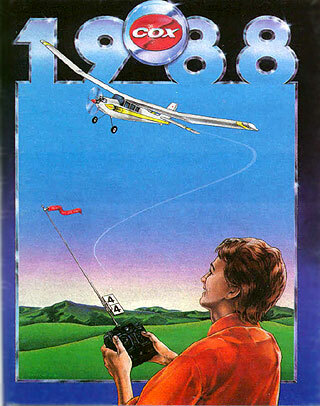 This picture has been provided by Mark Boesen. 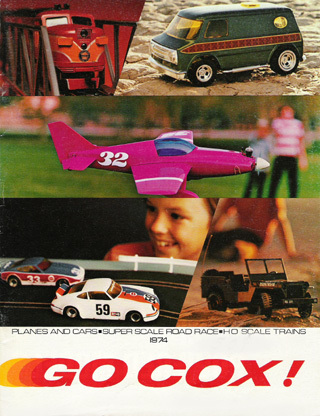 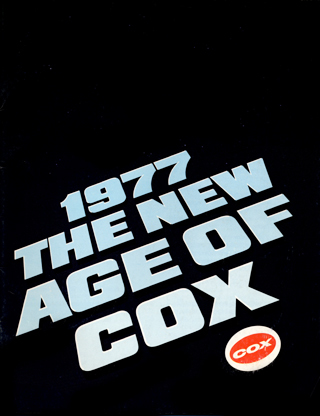 This year marked the 40th anniversary of Cox. 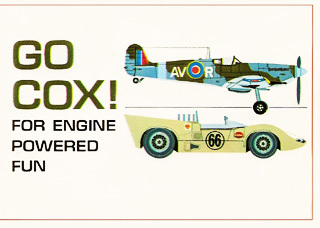 This picture has been provided by Warren Leadbeater. 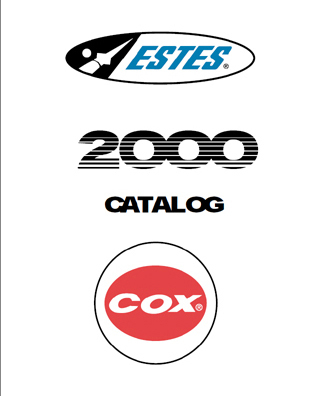 This is the year when Cox was sold to the Estes/Centuri group. 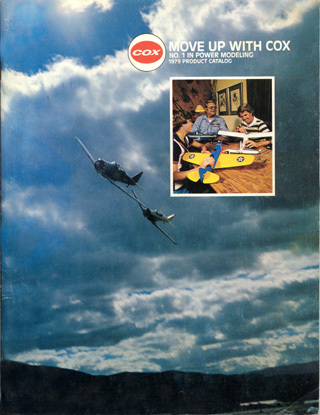 For many Cox enthusiasts and collectors this move ends the direct link to the ‘real’ Cox company. 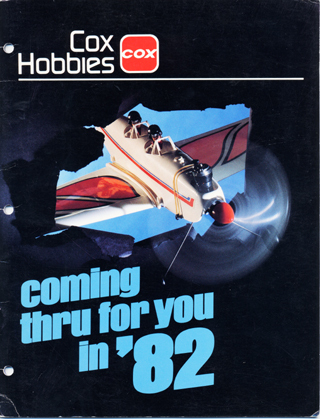 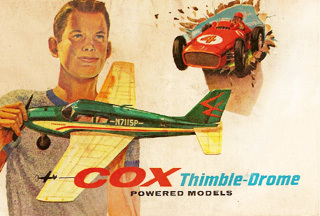 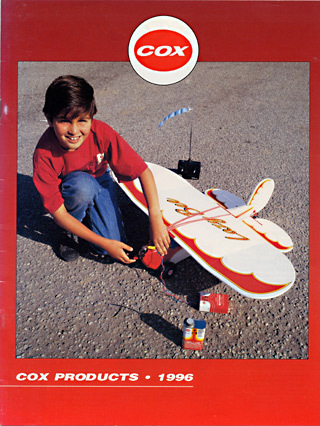 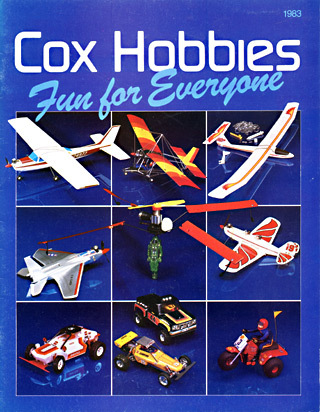 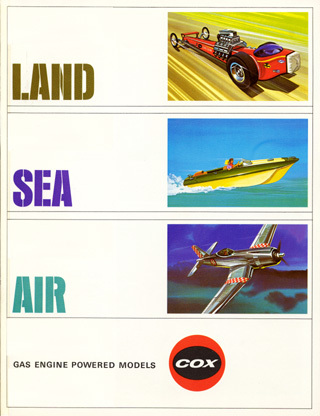 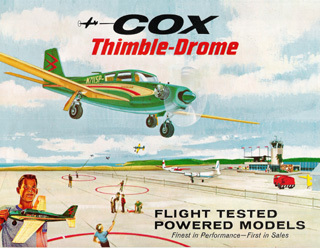 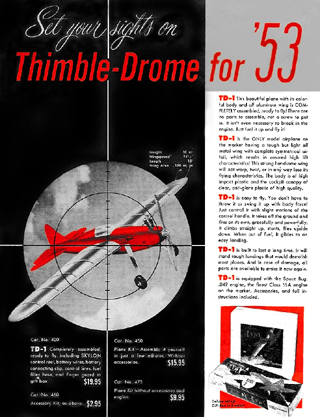 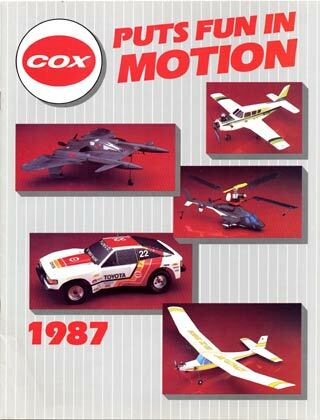 The 60th anniversary of Cox passed with Estes trying to move back into the powered model hobby market. 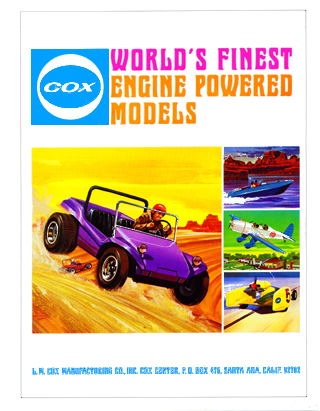 New R/C models are introduced, but in vain. 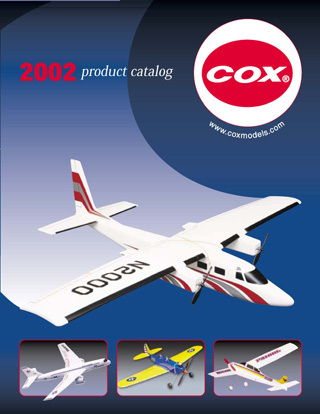 Competition is too far advanced and well established and the new product line is not attracting enough customers.